Alanya, formerly Alaiye, is a seaside resort city and a component district of Antalya Province in the Mediterranean Region of Turkey, 166 kilometres (103 mi) from the city of Antalya. On the southern coast of Turkey, the district (which includes the city and its built-up area) has an area of 1,598.51 sq km and (2000 Census) 257,671 inhabitants. The population is almost entirely of Turkish origin, but is home to around 10,000 European residents. Because of its natural strategic position on a small peninsula into the Mediterranean Sea, below the Taurus Mountains, Alanya has been a local stronghold for many Mediterranean-based empires, including the Ptolemaic, Seleucid, Roman, Byzantine, and Ottoman Empires. Alanya’s greatest political importance came in the Middle Ages, with the Seljuk Sultanate of Rûm under the rule of Alaeddin Keykubad I, from whom the city derives its name. His building campaign resulted in many of the city’s landmarks, such as the Kızıl Kule (Red Tower), Tersane (Shipyard), and Alanya Castle. The city has changed hands many times over the centuries, and its name has reflected this. Alanya was known in Latin as Coracesium or in Greek as Korakesion from the Luwian Korakassa meaning “point/protruding city”. Under the Byzantine Empire it become known as Kalonoros or Kalon Oros, meaning “beautiful/fine mountain” in Greek. The Seljuks renamed the city Alaiye (علاعية), a derivative of the Sultan Alaeddin Keykubad I’s name. In the 13th and 14th centuries, Italian traders called the city Candelore or Cardelloro. In his 1935 visit, Mustafa Kemal Atatürk finalized the name in the new alphabet as Alanya, changing the ‘i’ and ‘e’ in Alaiye, reportedly because of a misspelled telegram in 1933. Although first fortified in the Hellenistic period following the area’s conquest by Alexander the Great, the castle rock was likely inhabited under the Hittites and the Persian Empire. Finds in the nearby Kadrini cave indicate occupation during the Paleolithic era as far back as 20,000 BC. A Phoenician language tablet found in the district dates to 625 BC, and the city is specifically mentioned in the 4th-century BC Greek geography manuscript, the periplus of Pseudo-Scylax. Alexander’s successors left the area to Ptolemy I Soter after 323 BC. His dynasty maintained loose control over the mainly Isaurian population, and the port became a popular refuge for Mediterranean pirates. The city resisted Antiochus III the Great of the neighboring Seleucid kingdom in 199 BC, but was loyal to the pirate Diodotus Tryphon when he seized the Seleucid crown from 142 to 138 BC. His rival Antiochus VII Sidetes completed work in 137 BC on a new castle and port, begun under Diodotus Tryphon. The Roman Republic fought Cilician pirates in 102 BC, when Marcus Antonius the Orator established a proconsulship in nearby Side, and in 78 BC under Servilius Vatia, who moved on the Isaurian tribes. The period of piracy in Alanya finally ended after the city’s incorporation into the Pamphylia province by Pompey in 67 BC, with the Battle of Korakesion fought in the city’s harbor. Isaurian banditry remained an issue under the Romans, and the tribes revolted in the fourth and fifth centuries AD, with the largest rebellion being from 404 to 408. After the Roman Empire’s collapse and split, the city remained under Byzantine influence, becoming a suffragan of Side, in the metropolis of Pamphylia Prima. Islam arrived in the 7th century with Arab raids, which led to the construction of new fortifications. 681 marked the end of a bishopric in Alanya, although St. Peter of Atroa may have taken refuge here from iconoclastic persecution in the early 9th century. The area fell from Byzantine control after the Battle of Manzikert in 1071 to tribes of Seljuk Turks, only to be returned in 1120 by John II Komnenos. Following the Fourth Crusade’s attack on the Byzantines, the Christian Armenian Kingdom of Cilicia periodically held the port, and it was from an Armenian, Kir Fard, that the Turks took lasting control in 1221 when the Anatolian Seljuk Sultan Alaeddin Keykubad I captured it, assigning the former ruler, whose daughter he married, to the governance of the city of Akşehir. Seljuk rule saw the golden age of the city, and it can be considered the winter capital of their empire. Building projects, including the twin citadel, city walls, arsenal, and Kızıl Kule, made it an important seaport for western Mediterranean trade, particularly with Ayyubid Egypt and the Italian city-states. Alaeddin Keykubad I also constructed numerous gardens and pavilions outside the walls, and many of his works can still be found in the city. These were likely financed by his own treasury and by the local emirs, and constructed by the contractor Abu ‘Ali al-Kattani al-Halabi. Alaeddin Keykubad I’s son, Sultan Gıyaseddin Keyhüsrev II, continued the building campaign with a new cistern in 1240. At the Battle of Köse Dağ in 1242, the Mongol hordes broke the Seljuk hegemony in Anatolia. Alanya was then subject to a series of invasions from Anatolian beyliks. In 1293, the Karamanoğlu dynasty took control after Mecdüddin Mahmud conquered the city, but their rule was intermittent. Lusignans from Cyprus briefly overturned the then ruling Hamidoğlu Beylik in 1371. The Karamanoğlu sold the city in 1427 for 5,000 gold coins to the Mamluks of Egypt for a period before General Gedik Ahmed Pasha in 1471 incorporated it into the growing Ottoman Empire. The city was made a capital of a local sanjak in the eyalet of Içel. The Ottomans extended their rule in 1477 when they brought the main shipping trade, lumber, then mostly done by Venetians, under the government monopoly. On September 6, 1608, the city rebuffed an naval attack by the Order of Saint Stephen from the Republic of Venice. Trade in the region was negatively impacted by the development of an oceanic route from Europe around Africa to India, and in the tax registers of the late sixteenth century, Alanya failed to qualify as an urban center. In 1571 the Ottomans designated the city as part of the newly conquered province of Cyprus. The conquest further diminished the economic importance of Alanya’s port. Traveler Evliya Çelebi visited the city in 1671/1672, and wrote on the preservation of Alanya Castle, but also on the dilapidation of Alanya’s suburbs. The city was reassigned in 1864 under Konya, and in 1868 under Antalya, as it is today. During the 18th and 19th centuries numerous villas were built in the city by Ottoman nobility, and civil construction continued under the local dynastic Karamanid authorities. Bandits again became common across Antalya Province in the mid-nineteenth century. After World War I, Alanya was nominally partitioned in the 1917 Agreement of St.-Jean-de-Maurienne to Italy, before returning to the Turkish Republic in 1923 under the Treaty of Lausanne. Like others in this region, the city suffered heavily following the war and the population exchanges that heralded the Turkish Republic, when many of the city’s Christians resettled in Nea Ionia, outside Athens. The Ottoman census of 1893 listed the number of Greeks in the city at 964 out of a total population of 37,914. Tourism in the region started among Turks who came to Alanya in the 1960s for the alleged healing properties of Damlataş Cave, and later the access provided by Antalya Airport in 1998 allowed the town to grow into an international resort. Strong population growth through the 1990s was a result of immigration to the city, and has driven a rapid modernization of the infrastructure. The city has 95% literacy, with public and private schools, and a roughly 1:24 student-teacher ratio. Rural villages are, however, disadvantaged by the limited number of secondary schools outside the city center. Alantur Primary School, which opened in 1987, was built and is maintained under the Turkish “Build Your Own School” initiative, supported by the foundation of Ayhan Şahenk, the founder of Doğuş Holding. In 2005, Akdeniz University of Antalya launched the Alanya Faculty of Business, as a satellite campus that focuses on the tourism industry. The school hosts an International Tourism Conference annually in coordination with Buckinghamshire New University. The city also has plans to open a private university in 2012. Georgetown University operates an annual study abroad program for American students known as the McGhee Center for Eastern Mediterranean Studies, named for the United States Ambassador to Turkey from 1952–53 George C. McGhee, and based in his villa. Başkent University Medical and Research Center of Alanya, a teaching hospital run by Başkent University in Ankara is one of nineteen hospitals in Alanya. Other major hospitals include the 300-bed Alanya State Hospital and the 90-bed Private Hayat Hospital. Alanya’s culture is a subculture of the larger Culture of Turkey. The city’s seaside position is central to many annual festivals. These include the Tourism and Art Festival, which marks the opening of the tourism season from at the end of May or beginning of June. At the opposite end of the season, the Alanya International Culture and Art Festival is held in the first week of October, and is a notable Turkish festival. Other regular festivals include the Alanya Jazz Days, which has been held since 2002 in September or October at the Kızıl Kule, which is otherwise home to the municipal ethnographic museum. The Jazz Festival hosts Turkish and international jazz musicians in a series of five free concerts. The Alanya Chamber Orchestra, formed of members of the Antalya State Opera and Ballet, gave its inaugural performance on December 7, 2007. The International Alanya Stone Sculpture Symposium, begun is 2004, is held over the month of November. The Alanya Documentary Festival was launched in 2001 by the Alanya Cinémathèque Society and the Association of Documentary Filmmakers in Turkey. Onat Kutlar, Turkish poet and writer, and founder of the Istanbul International Film Festival was born in Alanya, as was actress Sema Önür. Atatürk’s Visit to Alanya is also celebrated on the visit’s anniversary each February 18, centered on Atatürk’s House and Museum. The Alanya Museum is home to archaeology found in and around the city, including a large bronze Hercules statue, ceramics, and Roman limestone ossuaries, as well as historic copies of the Qur’an. European residents of Alanya also often celebrate their national holidays, such as Norwegian Constitution Day. Iranians also celebrate the Persian New Year, Nevruz, in Alanya. Despite the seaside location, few residents make their living on the sea, and fishing is not a major industry. In the early 1970s, when fish stocks ran low, a system of rotating access was developed to preserve this sector. This innovative system was part of Elinor Ostrom’s research on economic governance which led to her 2009 Nobel Prize in Economics. 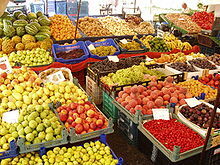 In 2007, locals protested the establishment of some larger chain supermarkets and clothing stores, which have opened branches in Alanya. Beginning in 2003, with the provisional elimination of restrictions on land purchases by non-nationals, the housing industry in the city has become highly profitable with many new private homes and condominiums being built for European and Asian part-time residents. Sixty-nine percent of homes purchased by foreign nationals in the Antalya Province and 29.9% in all of Turkey are in Alanya. Buyers are primarily individuals, rather than investors. This housing boom put pressure on the city’s many gecekondu houses and establishments as property values rise and property sales to locals fall. A height restriction in the city limits most buildings to 21 feet (6.5 m). This keeps high rise hotels to the east and west of the city, preserving the central skyline at the expense of greater tourist potential. The fringes of the city however have seen uncontrolled expansion. Alanya has a typical Mediterranean climate. The Mediterranean Basin ensures that most rain comes during the winter, leaving the summers long, hot, and dry, prompting the Alanya board of Tourism to use the slogan “where the sun smiles”. Storm cells sometimes bring with them fair weather waterspouts when close to the shore. The presence of the Taurus Mountain in close proximity to the sea causes fog, in turn creating visible rainbows many mornings. The height of the mountains creates an interesting effect as snow can often be seen on them even on hot days in the city below. The sea at Alanya has an average temperature of 21.4°C (70.5°F) annually, with an average August temperature of 27.9°C (82.2°F). On the peninsula stands Alanya Castle, a Seljuk era citadel dating from 1226. Most major landmarks in the city are found inside and around the castle. The current castle was built over existing fortifications and served the double purpose of a palace of local government and as a defensive structure in case of attack. In 2007, the city began renovating various sections of the castle area, including adapting a Byzantine church for use as a Christian community center. Inside the castle is the Süleymaniye mosque and caravanserai, built by Suleiman the Magnificent. The old city walls surround much of the eastern peninsula, and can be walked. Inside the walls are numerous historic villas, well preserved examples of the classical period of Ottoman architecture, most built in the early 19th century. The Kızıl Kule (Red Tower) is another well-known building in Alanya. The 108-foot (33-m) high brick building stands at the harbor below the castle, and contains the municipal ethnographic museum. Sultan Alaeddin Keykubad I brought the accomplished architect Ebu Ali from Aleppo, Syria to Alanya to design the building. The last of Alanya Castle’s 83 towers, the octagonal structure specifically protected the Tersane (dockyard), it remains one of the finest examples of medieval military architecture. The Tersane, a medieval drydock built by the Seljuk Turks in 1221, 187 by 131 feet (57 by 40 m), is divided into five vaulted bays with equilateral pointed arches. The Alarahan caravanserai near Manavgat, also built under Keykubad’s authority, has been converted into a museum and heritage center. Atatürk’s House and Museum, from his short stay in the city on February 18, 1935 is preserved in its historic state and is a good example of the interior of a traditional Ottoman villa, with artifacts from the 1930s. The house was built between 1880 and 1885 in the “karniyarik” (stuffed eggplant) style. Bright colors and red roofs are often mandated by neighborhood councils, and give the modern town a pastel glow. Housed in a 1967 Republican era building, The Alanya Museum is inland from Damlataşh Beach. With its rich architectural heritage, Alanya is a member of the Norwich-based European Association of Historic Towns and Regions. 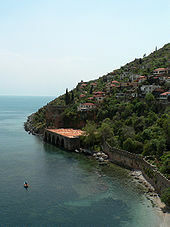 In 2009, city officials filed to include Alanya Castle and Tersane as UNESCO World Heritage Sites, and were named to the 2009 Tentative List. Alanya was set up as a municipality in 1872, electing its first mayor in 1901. Today, Alanya is governed by a mayor and a municipality council made up of twenty-five members. Twelve councilors are of the Justice and Development Party (AKP), which is currently in power in the national government. Eight councilors are from the center-right Motherland Party, with three members from the center-left Republican People’s Party, two from the far-right Nationalist Movement Party. Mayor Hasan Sipahioğlu was formerly with the Motherland Party, but on July 12, 2009 joined the AKP. Sipahioğlu was first elected in 1999, and was reelected in 2004 and 2009. Elections are held every five years, with the next to be held in March 2014. Alanya also has a deputy mayor, who often represents the city at its sporting events. Alanya District is divided up into 17 municipalities, including the city center, and 92 villages. Alanya is greatly influenced by the provincial government in Antalya, and the national government in Ankara, which appoints a governor for the district, currently Dr. Hulusi Doğan. Although Alanya has been part of Antalya Province since the Ottoman Empire, many local politicians have advocated a separate Alanya Province. Nationally, in the 2007 election, the province voted with the Justice and Development Party, who were followed closely by the Republican People’s Party and the True Path Party. Mevlüt Çavuşoğlu, of the Justice and Development Party, is the only native Alanyalilar Member of Parliament representing Antalya Province in the Grand National Assembly, where he chairs the Committee on Migration, Refugees and Population. He is also the current president of the Parliamentary Assembly of the Council of Europe. Since the first modern motel was built in 1958, considered the first year of the tourist industry in Alanya, hotels have raced to accommodate the influx of tourists, and the city as of 2007 claims 157,000 hotel beds. Damlataş Cave, which originally sparked the arrival of outsiders because of the cave’s microclimate, with an average temperature of 72 °F (22 °C) and 95% humidity, is accessible on the west side of the peninsula with trails from Damlataş Beach. Many tourists, especially Scandinavians, Germans, Russians, and Dutch, regularly vacation in Alanya during the warmer months. They are drawn to the area because of property prices, warm weather, sandy beaches, access to Antalya’s historic sites, and fine cuisine. Other outdoor tourist activities include wind surfing, parasailing, and banana boating. Attractions include Europe’s largest waterpark, Sealanya, and Turkey’s largest go-kart track. Hunting season also attracts some tourist for wild goat, pig and partridge hunting in area nature reserves. For various reasons, tourist seasons after 2005 have been disappointing for Alanya’s tourism industry. Among the reasons blamed were increased PKK violence, the H5N1 bird flu found in Van, and the Mohammad cartoon controversy. Alanya officials have responded with a variety of publicity initiatives, including baking the world’s longest cake on April 26, 2006, a Guinness World Record. The economy has also suffered due to investment in more than 20,000 surplus properties. 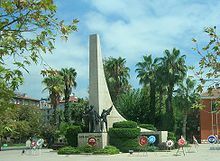 The D 400 Highway, the Alanya–Mersin Route, connects Alanya from the east and west, encircling it, and linking through the city center via Atatürk Bulvarı. The D695, the Ankara–Akşehir Route, runs north–south and reaches the sea 41 kilometres (25 mi) west of the city near Side, connecting with the D400. Antalya Airport is 121 kilometres (75 mi) away and connects internationally. The new Antalya Gazipaşa Airport, first begun in 1992, is only 14.5 kilometres (9.0 mi) from the city, and was expected to have its first regular domestic flights on May 22, 2010, although international flights were not expected before the start of the 2011 tourist season. No train routes go to Alanya or Antalya Province, and there are no train stations in the district. There are bus and dolmuş systems out of Alanya’s two bus depots, but buses are usually limited to the major roads, and inside the city transportation is by car, taxi, or foot, as many roads in the old town are closed to vehicle traffic. The harbor includes cruise ship piers, and also seasonal ferries and hydrofoils depart for Kyrenia in the Turkish Republic of Northern Cyprus. 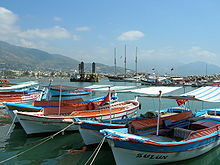 Further west of the city is the Alanya Yacht Harbor, a marina, which started services in 2008. The 85-km2 (33-sq-mi) marina allowed Alanya to participate in the 2008 Eastern Mediterranean Yacht Rally. The city is also investing in a community bicycle program with 150 bicycles and twenty terminals. From only 87,080 in 1985, the district has surged to hold a population of 384,949 in 2007. This population surge is largely credited to immigration to the city as a result or byproduct of the increased prominence of the real estate sector and the growth of the housing market bubble. The city itself has a population of 134,396, of which 9,789 are European expatriates, about half of them from Germany and Denmark. 17,850 total foreigners own property in Alanya. The European expatriate population tends to be over fifty years old. During the summer the population increases due to large numbers of tourists, about 1.1 million each year pass through the city. Both Turks and Europeans, these vacationers provide income for much of the population. The city is home to many migrants from the Southeastern Anatolia Region and the Black Sea region. In the 2000s, the town has seen a surge in illegal foreign immigrants from the Middle East and South Asia, both to stay and to attempt to enter European Union countries. As of 2006, 1,217 migrants claim residence in Alanya while working abroad. Yörük nomads also live in the Taurus Mountains north of the city on a seasonal basis. Additionally, there is a small African community descendant from imported Ottoman slaves. The town is nearly 99% Muslim, and although many ancient churches can be found in the city, there are no regular Christian services. In 2006, a German language Protestant church with seasonal service opened with much fanfare, after receiving permission to do so in 2003, a sign of the growing European population in the city. The town provides the Atatürk Cultural Center to Christian groups on a regular basis for larger religious ceremonies. Israeli tourists, often from cruise ships, constitute the Jewish population. These are occasionally the targets of discrimination, particularly at times of high tension, such as the 2006 Israel-Lebanon conflict, when a shopkeeper denied Israelis entry. Alanya is home to a woman’s basketball team, Alanya Belediye, which started in the first division but was relegated after the 2002 season. The city hosts a third level soccer team, Alanyaspor. The club was founded in 1948, and play home games at Milli Egemenlik Stadium. It played in the Second League between 1988-1997. In 2007, the city began constructing a new soccer facility with the intention of hosting winter competitions between major teams. The public Alanya Municipality Sports Facility is located adjacent to Milli Egemenlik Stadium, which is one of thirteen facilities. Alanya’s waterfront location makes it suitable for certain events, and is perhaps most famous for its annual triathlon, part of the International Triathlon Union series, which has been held every October since 1990. Marathon swimming competitions have also been connected to the triathlon since 1992. Building on the triathlon’s success, Alanya hosted a modern pentathlon in 2009. Alanya is also the regular host of The Turkish Open, part of the Nestea European Beach Volleyball championship tour, which takes place in May. In 2007, the Turkish Volleyball Federation persuaded the European Volleyball Confederation to build a beach volleyball training facility in Alanya, and make it the exclusive “center of beach volleyball in Europe”. The city is also a frequent host to national events, such as the annual beach handball tournament, and the finish of the seven-day Presidential Cycling Tour of Turkey. Other cycling events include the Alanya International Mountain Bike Race. Additionally, the European Cycling Union will have its 2010 European road cycling championship and 2010 ordinary congress meeting in Alanya. © Alanya Oasis - from Toroslar Ltd.